Dozens of people who are unlawfully being rented accommodation in an "unauthorised hostel" will have to leave the premises by Wednesday following a court order. Judge Jacqueline Linnane heard The Pines, Lehaunstown, Cabinteely, where South Americans and Eastern Europeans are currently living in dangerous, unhealthy and cramped conditions, was being rented by its owner, Richard Stanley, to a Christian Carter. Barrister Michael Binchy, for Mr Stanley, said his client was in his 80s and in poor health. Mr Stanley had rented the property to Mr Carter, with addresses at Dunedin Drive, Monkstown, Co Dublin, and Grove Park, Rathmines, and had been unaware of the situation. Counsel said Mr Stanley was consenting to orders sought by Dun Laoghaire-Rathdown County Council restraining the use of the house as a multi-occupancy dormitory property. The court heard that a son of Mr Stanley, who lives in the UK, had arranged for the tenancy agreement with Mr Carter, who rented the property for €4,000 per month. Judge Linnane was told the agreement had not been registered with the Residential Tenancy Board and Mr Carter had been making up to €1,500 a month profit out of the property by sub-renting it. Barrister Liam O'Connell, who appeared for the local authority, said Dun Laoghaire-Rathdown County Council was also seeking to join Mr Carter to the proceedings. Mr Binchy said Mr Carter had stated in an email he would empty the premises by March 1, but Mr Stanley and the council had concerns about the welfare of the residents and thought the date was too far away. Mr O'Connell told Judge Linnane that the residents were aware of the proceedings "coming down the track" and of various inspections of the premises by the local authority. The court heard they expected they would have to vacate the premises. Last Monday, when the matter first came before the court, counsel had said the overcrowded private dwelling was considered a fire and health risk. "It has come to the council's notice that the three-storey dwelling is being used as other than a private dwelling with up to 17 individuals in one room and about 36 people housed in the basement," Mr O'Connell told the court. Aonghus O Neill, a local authority planning inspector, stated that the Lehaunstown house, on four levels, comprised a two-room basement, a ground floor, first floor and attic level. Mr O'Connell told Judge Linnane that the county council had become aware of reports that up to 70 people were being accommodated in the house. 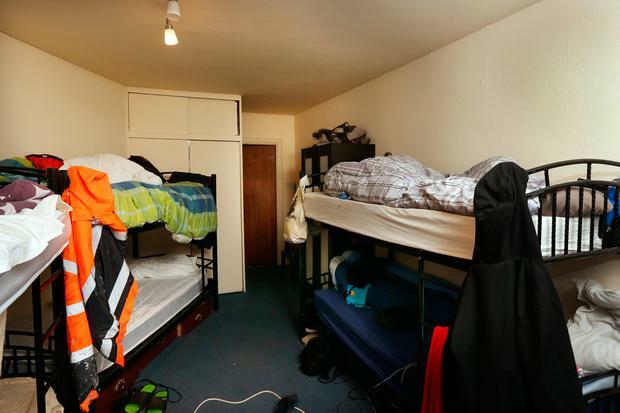 He said Mr O'Neill and another council inspector found that almost every room they could obtain access to had been filled with double-beds or bunk beds. Loose electrical cord providing power to a washing machine and two tumble dryers at the top of a stairs leading to the basement had to be avoided. In a boiler room there were no smoke or heat detectors and flammable materials were scattered about the room. One room in the basement contained 11 bunk beds and a second room contained five bunk beds and two double beds. There were electrical extension cables across the floor. They had found a communal dining room and a living room, which had been turned into dormitories. Three rooms on the first floor had been locked shut. Mr O'Connell said the use of the property had changed from that of a private dwelling to one involving the provision of accommodation to paying customers, whereby occupants were accommodated in large communal dormitories. The local authority sought orders to immediately end the use of the property "as what can only be described as an unauthorised hostel". Judge Linnane granted the local authority an order to cease unauthorised development at the property by midday on Wednesday, February 1. The judge ordered that court documents be served on Mr Carter at his two addresses and also on the occupants at the Lehaunstown house. She adjourned the matter to Thursday.